Reach new audiences, generate qualified leads and accelerate marketing pipeline. 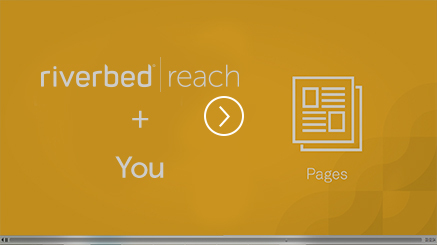 Riverbed Reach exists to enhance your internal marketing resources with one goal in mind – to help you drive revenue. Whether you are a lean marketing team that needs to increase bandwidth and agility, or a marketer looking to tap into advanced martech tools and services to maximize your efforts, Riverbed Reach is here to help. Amplify your reach and accelerate your marketing-led pipeline with flexible, ready-to-use campaigns, automation tools and localization options. Or, let the concierge service do the heavy lifting for you. Further your reach. Drive more Demand. All with Riverbed Reach. Riverbed Reach offers you a range of no-cost and value-added services that expand your marketing to help you generate improved results and win more business. You′ll gain flexibility, access to technology and resources to help accelerate your marketing-led pipeline. Cut through the noise in the market with a message that stands out from your competitors. A specialist will help you develop a unique value proposition, focusing on key differentiators to make your business the logical choice to meet your customers′ critical technology needs. Reach new prospects with versatile translation services that make expanding your campaigns into new regions a reality. Market your message in your language of choice with highly accurate software translation and localized design options that appeal to your local culture. Choose from high-performance campaigns, ready for you to deploy. All campaigns come with pre-built assets, customizable with your message and branding. Go to market by leading with your unique value proposition and positioning to drive demand. Tap into a no-cost marketing automation platform to expand your marketing capabilities. Access emails, landing pages, display advertisements, social content and lead nurture workflows – while measuring performance with automated reporting. It is easy to extend your campaigns and further qualify the leads from your marketing campaigns using Riverbed-trained sales development reps, skilled at converting interested prospects into sales-ready appointments for your team. Create a unique and meaningful event using content and expertise aligned with your specific objectives. Reaching your intended audience has never been easier with easy-to-use registration pages and templated invites. After your event, use automated follow-up services including telemarketing, lead qualification and nurturing. Create your Riverbed Reach Account Profile to view available campaigns and service packages. Hear the latest on market trends, technology innovation, demand generation marketing best practices and how to increase the business value of partnering with Riverbed.